Kittyhappydancing! I can call this one done! I am just so tickled that this one is done – I’m sure that Ky is going to be tickled too when he can use it tomorrow after it’s been washed .. This went really quick on the binding .. altho the last 12″ took forever compared to the rest of the binding .. the label was the hard part .. 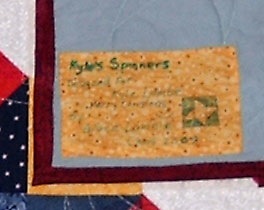 I didn’t want to put it on a plain piece of muslin and didn’t want to go bother with doing freezer paper and printing .. so I just grabbed a scrap of material that was in the quilt itself and did that .. the other option would have been square in square and signed that part .. altho I was considering doing a small friendship star as a label like I did in the borders .. but I did want to get this done tonite! Now comes the hard part .. submitting it for publication (!!) EEEEEEKKKKKKKKKKKKK I need to reread the submission guidelines, and get a really good daylight pic of it .. as all the ones that I have of this quilt are inside / nite shots ..
Well one down 😀 and boy does this feel GREAT!!! Grace…not sure if you noticed that all three of the friendship stars in the outer border toward the front are not going the same way. You might want to correct it before publication…good luck!!!!!!!!!!!!!! Thanks for all that you share! Thank you for the good lucks! Absolutely gorgeous and I love the colors. Ditto on the friendship star being turned wrong, but I just love it. Hope to see it when it is printed. Very pretty! Feels good to have it completely done doesn’t it? 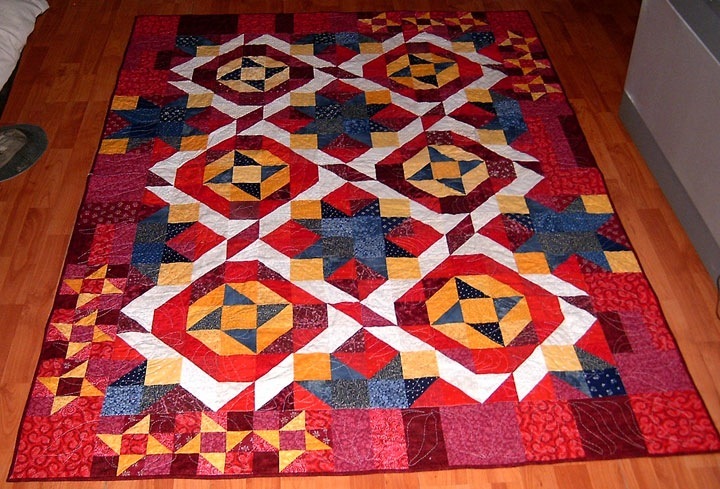 Terrific quilt – I love the colors! You know I totally heart this quilt. I’ll be looking forward to seeing it in print. Oh – and thanks for showing what a finished project looks like. It’s been so long since I’ve seen one around my place, I’d forgotten…!! I love this quilt! Love red and friendship stars, so this is right up my alley! Job well done and good luck. It is fantastic. Love it.